The valley of the sun is a diverse desert with lots of space, which is why its one of the largest cities in the United States, typically floating around the midway mark on a list of the 10 largest cities. 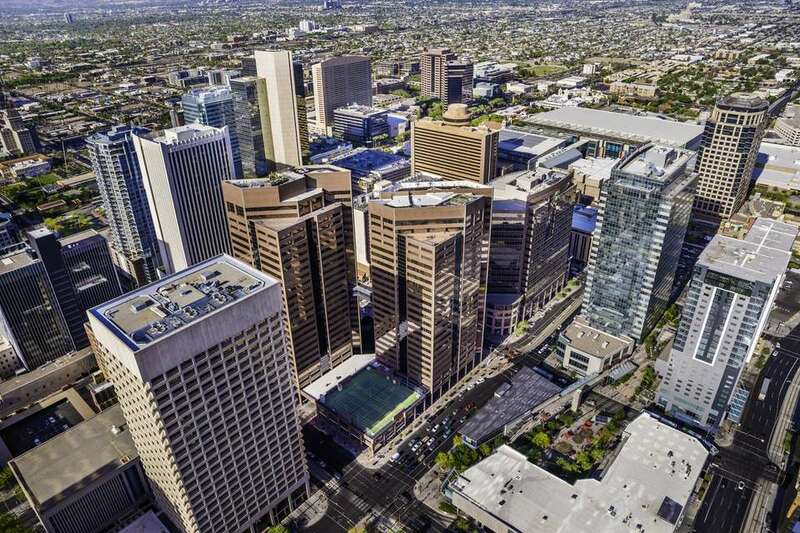 With so much space, its no wonder that the Phoenix metro area consists of so many different neighborhoods and towns that help bring a sense of diversity to a city with a flat topography. Next time you’re in Phoenix, check out some of the unique neighborhoods within the city and some that surround it. One of the most desirable addresses in Phoenix, Arcadia promises leafy street, historic citrus groves and some of the best dining and shopping in the city, which is what makes it one of Phoenix’s most beautiful and popular neighborhoods. Arcadia is home to one of the most prominent natural landmarks in the Phoenix Metro area, Camelback Mountain, named so for its resemblance to a kneeling camel. From Arcadia, there are unbeatable views of the mountain as well as easy access to some of the best hiking in the city at Camelback Mountain Echo Canyon Recreation Area, situated between the Arcadia neighborhood and the town of Paradise Valley. Arcadia is also home to some of the oldest luxury resorts in the city, including the Arizona Biltmore Resort and Spa. Biltmore Fashion Park, a high-end shopping and dining destination is also located at the edges of the Arcadia neighborhood. Central Phoenix, or CenPho, as some of the locals like to call it (mainly the folks who live there), is the nexus of the city’s art and culture scene. It’s the place to discover new restaurants, catch a play or hit the club late at night. Gentrification is no stranger to CenPho, but there are still up and coming parts of this neighborhood. Home to the Phoenix Art Museum's vast holdings of European, Spanish Colonial and Southwestern art, CenPho is one of the city's top cultural destinations. Additionally, the Phoenix Art Museum is slowly becoming a venue for cutting edge contemporary art, which is helping to attract new visitors to the museum. Every Saturday morning, an unassuming parking lot at 721 North Central Avenue is converted into a festive farmer's market, which isn’t huge by most standards, but Phoenix’s long-running open-air market sure is popular. This creatively fueled district links downtown to several residential neighborhoods. Former homes here have been reimagined into cool hangouts of all sorts. Expect to find really cool patio hangouts and sidewalk cafes, as well as funky boutiques to find all the things you never knew you needed. Independent films, craft beer, art openings and special events make RoRo (yes, another nickname that isn’t widely known outside of the actual neighborhood) hot. Art lovers will get a kick out of the plentiful street art and many of Phoenix’s best art galleries and museums. Of particular interest is the Heard Museum of Native Cultures and Art, where visitors can familiarize themselves with the folk art of the desert Southwest and purchase handmade items from the gift shop. Downtown is the nexus of commerce, art and culture. The downtown scene has become re-energized in recent years with the arrival of several new mixed-use commercial buildings, which is giving the neighborhood’s shopping a dining scene a new, fresh life. Here its easy to explore the busy city streets by foot and visitors can take in a show, visit a world-class museum or grab a bite at Pizzeria Bianco, named the best pizza in the country by the New York Times—the pizza menu only features six wood-fired pizzas, but once you have a bite, you’ll know why it’s the best. Located immediately south of the downtown core, this neighborhood has seen a burst of revitalization in recent years but its grittiness still gives it its edge that other neighborhoods have lost. The buildings, which were built from the 1800s through the 1940s, were done dock height to accommodate horse-drawn wagons, trains and trucks. After World War II, Phoenix experienced suburban flight, and a lot of the activity here dwindled. Some of the warehouses were leveled, but this neighborhood has one of the best collections of historic brick and concrete buildings in the state. This once-forgotten downtown community can credit its renewal to the restaurants and bars, venues, galleries and eclectic work spaces that dominate it, and it also happens to be located next to the nearby sports stadiums, which helps drive traffic to the neighborhood. The Warehouse District also included the city’s once-vibrant Chinatown and a Mexican neighborhood, creating a melting pot of cultures. Located just west of Central Avenue between Thomas and McDowell, Willo is one of Phoenix’s most iconic and beautiful historic neighborhoods. With unique homes built in the 1920s, 30s and 40s, beautiful tree-lined streets, front porches, guest homes, the area is very desirable for a wide variety of Phoenicians. Originally one of Phoenix’s first historic suburbs planned in the 1920’s, they are now part of the core of Central Phoenix and all the amenities, culture, and community the area has to offer. Come here to walk the palm-lined streets and catch a glimpse into the city’s past with historic architectural styles such as Tudors, Bungalows, Spanish Colonials, as well as Ranch style homes. Another historic neighborhood in the North Central corridor of Phoenix is Medlock Place, the city’s original suburban residential development. First opened to the public in 1926, Medlock Place was then 4 miles north of the edge of town. When Floyd Medlock first started developing Medlock Place in the 1920s, he aimed to build a community that melded the convenience of the city with the charm of the country. Although Phoenix has boomed around the neighborhood, Medlock's intention still shines through in the bungalow, Spanish colonial, pueblo revival, and ranch homes. Plus, all the lush foliage that's matured over the years definitely doesn't hurt the "rural" feel Medlock was going for. This early 2000s neighborhood has a bit of a rural Stepford feel to it. It’s a bit subtler than other modern planned communities and can be easily overlooked when one takes the time to consider the urban farm that has now developed into a community. This planned community offers a modern village life surrounding 11 acres of urban farmland, where a tree-lined sidewalk leads you to a chef-driven restaurant, where creative spaces encourage craftsmanship, and where charming homes nestle close. Here, people live, work, eat, shop, create, and come together. The idea of Agritopia is intriguing and seems to be working very well for the community that lives there. Agritopia is made up of homes ranging in size and style, the farm, a community garden, two restaurants, a school, and more. Located in midtown Phoenix, the Coronado neighborhood covers over 1.75 square miles and includes around 4,000 households. Three historic districts—Brentwood, Coronado and Country Club Park—make up much of the neighborhood. The western side of Coronado was constructed largely between 1920 and 1930 and reflects the California Bungalow and Spanish Colonial Revival building styles; the northern side is predominantly ranch styles common of the 1940’s. Much of the neighborhood falls within the Phoenix Historic Preservation zoning guidelines. The Coronado neighborhood is centrally located and is in close proximity to the Phoenix downtown & central corridor, the “arts district”, and the light rail line. Try saying that name three times fast. The southern section of the city of Phoenix is known for its popular stucco homes with red-tile roofs, and where circle roadways are the norm. Ahwatukee is located next to South Mountain Park and has the accolades of great schools and abundant shopping options. Considered part of the East Valley, the area draws many families and people who want to be closer in but still live a suburban life. Expect a suburban lifestyle near a large mountain preserve. People are often out on the community’s trails and loop roads walking, hiking or biking.